Your customers are not “one size fits all.” Your email marketing shouldn’t assume they are, but that’s what happens when you only send broadcast messages (“one to everybody”). Segmentation is one way to make your messages more relevant. But, tying your email messages to different experiences in your customer’s lifecycle with your brand helps you go beyond this first step. It makes your emails more personalized, customer-centric and helpful. Those three qualities make your emails more valuable to your customers, and the more value your customers see in your emails, the more likely they are to open and act on them. The result is a stronger customer relationship, higher return on your investment and more revenue to enrich your company’s bottom line. You don’t have to look too hard to find examples of lifecycle email marketing messages and programs. They’re probably in your own inbox now! The graphic below maps a series of customer-experience emails against the major points on a retail customer journey. I’ve used this graphic to curate a collection of nine emails that look great without complex data integrations or automations. You might think of this as the classic “welcome” email you send to new customers or subscribers. But, what’s your real purpose for this message? To move your customer back to your website to take the action you want. In retail, this often is the first purchase. This email serves a greater purpose than simply welcoming a new subscriber. Centering this email program on your goal, as this email does, helps you create a focused message with copy and images that are more likely to get customers to act. The tone is welcoming and friendly and reflects the informal but focused approach you see on the website. I like the directional cue in the top image—a woman in glasses looking directly at the headline. The email restates the expectations for the email program (“Awesome things coming your way”). It’s designed to drive action. It lists benefits of shopping with the brand (selection, free shipping, free returns), adds a clear call to action that tells readers what you want them to do and offers value by telling readers to connect their vision benefits. Worldwide, more than 7 in 10 shopping carts get left in virtual aisles for one reason or another (comparison shopping, interruptions, shipping or checkout issues, using the cart like a shopping list/wish list). 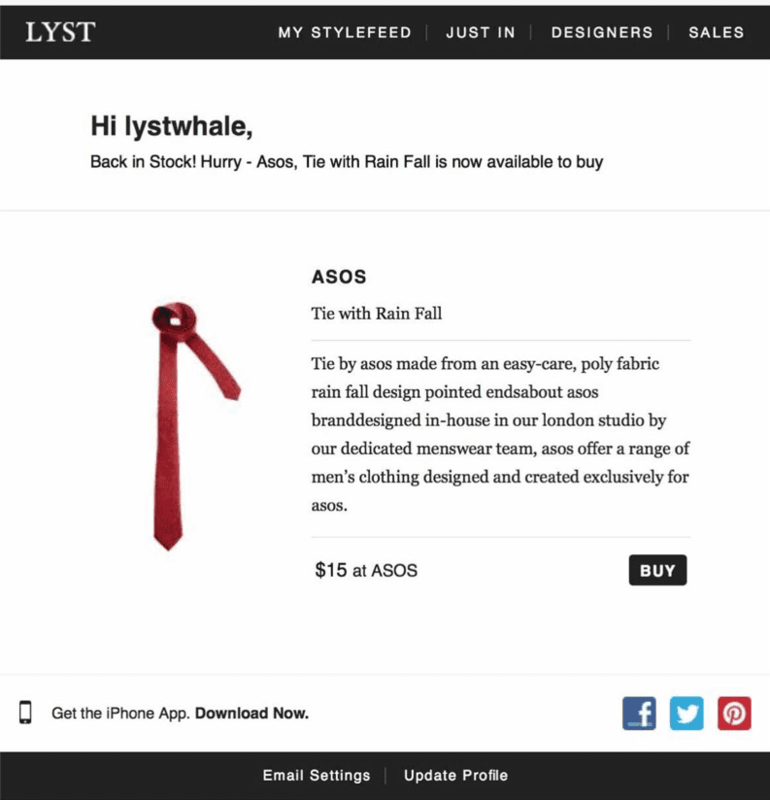 Here’s another email designed to bring your browsing customers back to purchase. 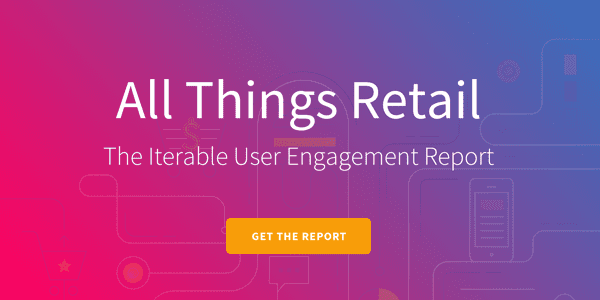 Handled clumsily, it can look and feel as if you’re tracking your customers’ every move. To avoid the creepiness factor, keep customer experience principles in mind, such as helpfulness through answering questions and personalizing the email. Another way is to mix content from the abandoned browse session with modules containing related or generic products or pages, as seen in J. Jill’s email below. 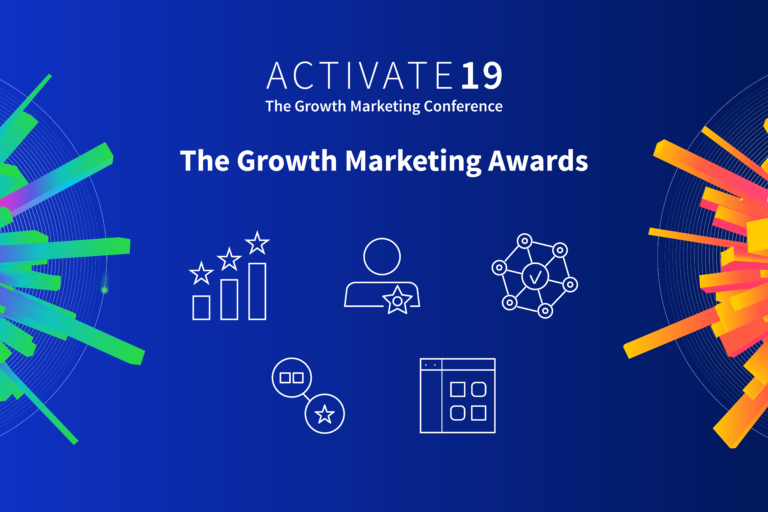 This covert approach makes the email look like an unexpectedly relevant broadcast email, and the most relevant content—products/pages relating to the abandoned browse session—will stand out. 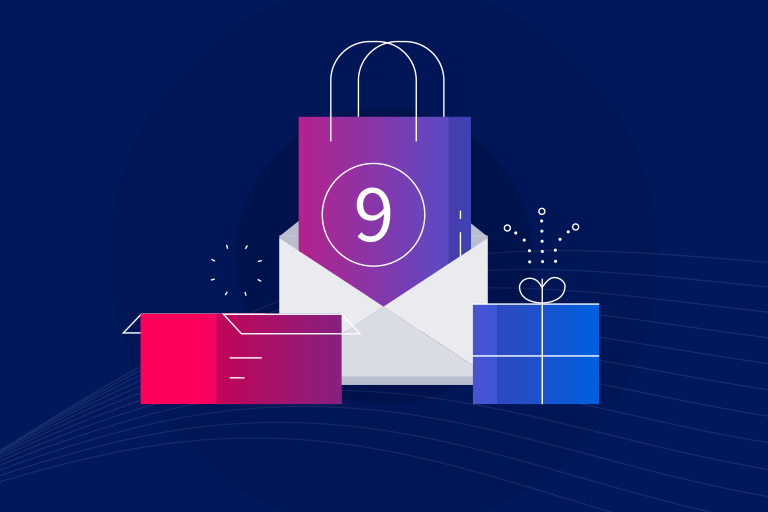 The second purchase might be harder to win than the first one was, but a carefully designed series of emails like the one below will increase your chances of gaining that much sought-after next purchase. Retailers are all-too-familiar with the challenge of gaining a second purchase. One-time buyers make up to 80% of a retailer’s database. So, why leave it to chance that they’ll come back on their own? Create a dedicated series to ensure customers come back to buy again. On that note: If you have looked into your data and found that those who buy four times are most likely to become loyal customers, then expand your repurchase plan to include a Third Purchase Program and a Fourth Purchase Program. 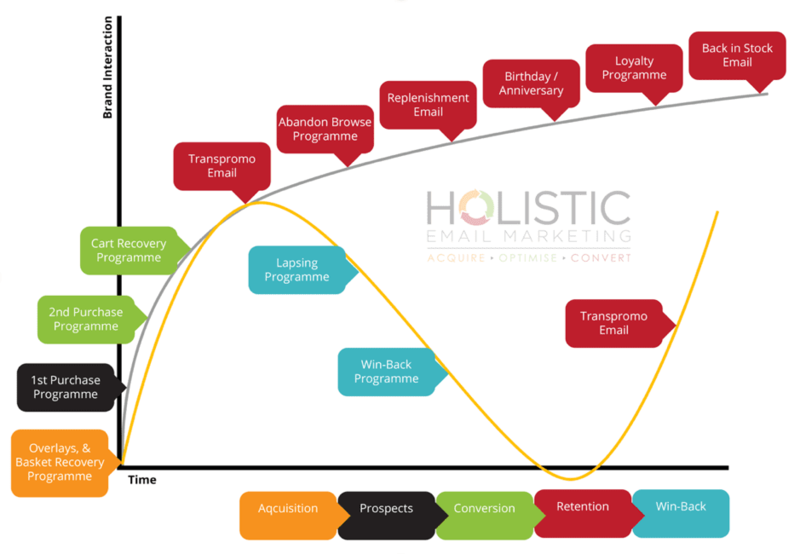 This is the essence of what Lifecycle Marketing does—it helps you resolve problems and challenges. This email from Hot on the High Street, the first of a three-part series, has a friendly greeting, customer-focused copy (can you count all the “you” and “your” pronouns?) that highlights the benefits of using this retailer, quick links to popular shopping categories and a link to download its shopping app. All the CTAs are written to drive action, too. Emails 2 and 3 in the series focus on other benefits of getting the brand’s email. 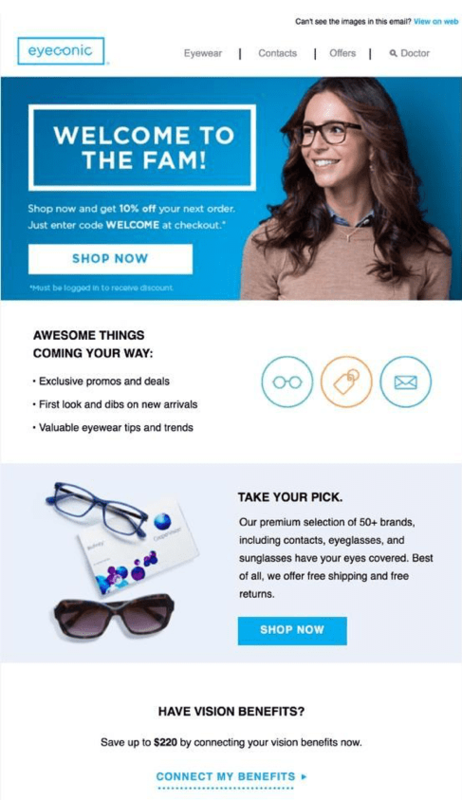 The final email is clearly designed to drive action because it focuses on a purchase incentive. If you don’t have your customer’s birthdate, don’t fret. Celebrate other moments instead! 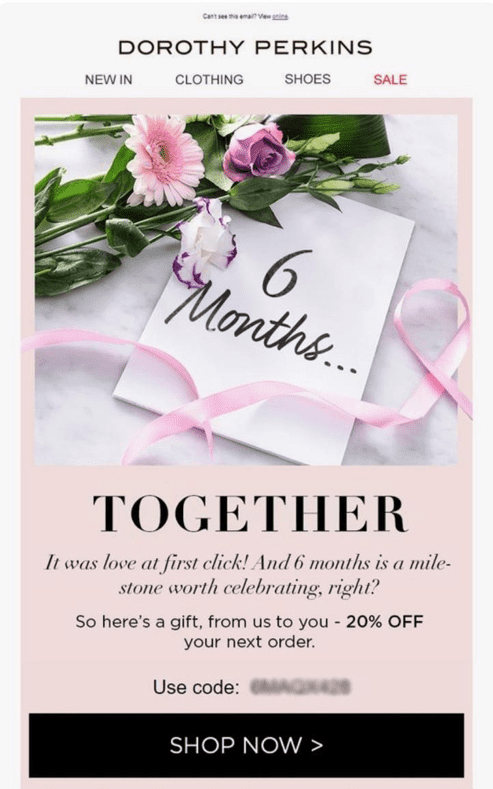 I picked this customer anniversary email from Dorothy Perkins because it’s easy to personalize, whether you choose to recognize the day a customer opted in, made their first purchase, joined a loyalty club or any other significant event. It’s personalized to show the time period, both in the image and the copy, and it includes an offer to drive a purchase. This program is as much about service as it is about sales. 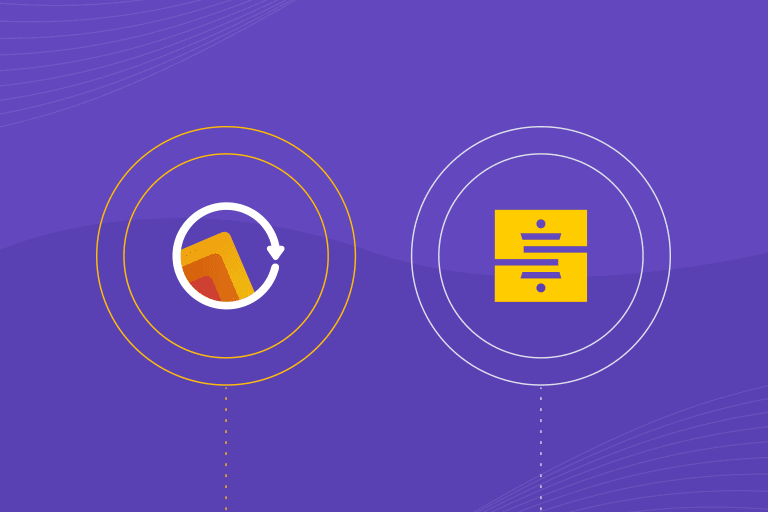 Create rules in your marketing automation platform to trigger emails timed to a product’s general use cycle to encourage reorders. 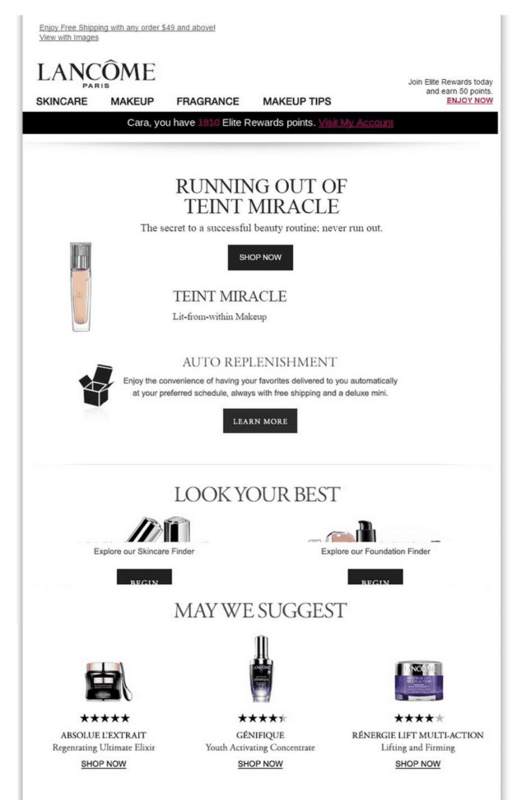 This email from Lancôme below displays the product name, image and price along with a benefit-driven promo for its auto-replenishment program. It also cross-sells and upsells related items. If you have a service that lets customers ask you to notify them when the product they want is back in stock, this is the kind of email you should send. It’s helpful, personalized with the product image and details and totally customer-focused. Another great service is the wish list, which lets customers create virtual lists of items they like but either aren’t ready to buy or want to share with someone. When items on their wish lists go on sale, you’re duty-bound to let your customers know, right? 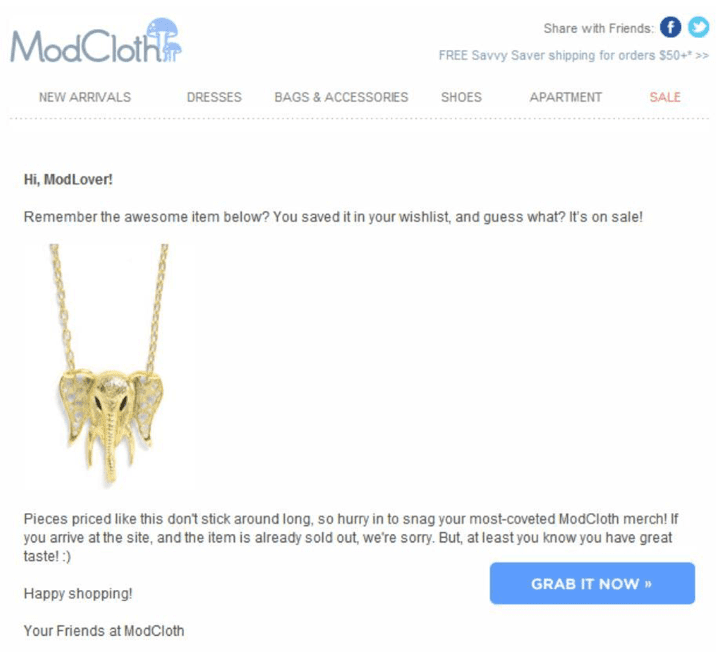 Similar to the abandoned-cart and back-in-stock emails, this reminder from ModCloth below is very customer-service led and displays the product image, description and price, links to the product page and reminds the customer why she’s getting that message. This is an important point on the customer lifecycle and another reason why relying on broadcast (1:everybody) email can mean losing customers. 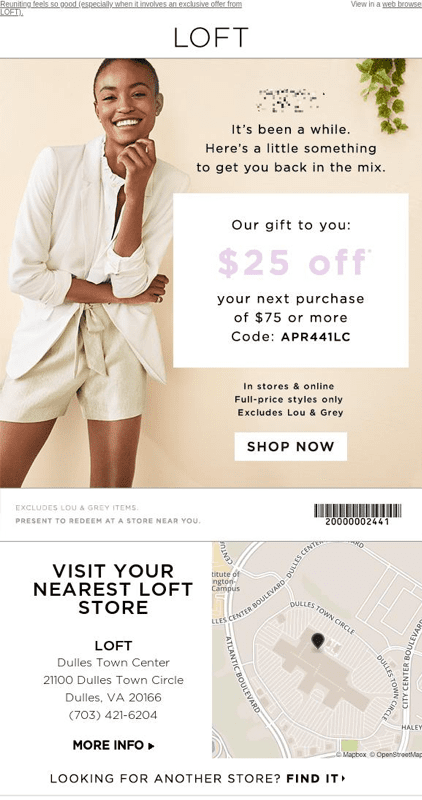 Win-back emails are focused on bringing customers back to purchase again, but they can also be a painless way to reach out to silent or lapsing customers to uncover unresolved issues and to restate your benefits and values, as this email from LOFT does. This email offers a service that’s essential for “brick and click” retailers—the ones with both physical stores and e-commerce operations: using location data to helpfully pinpoint the nearest stores. If you don’t have the ability to tie their email activity to their purchase activity then state it clearly as Belk has done below. This will avoid confusion if they have recently purchased but simply not been opening and actioning their emails. Sometimes a broadcast email can help you achieve a goal for your email marketing program. But, when you rely on it, you’ll overlook dozens of opportunities to connect in more meaningful ways with your customers. 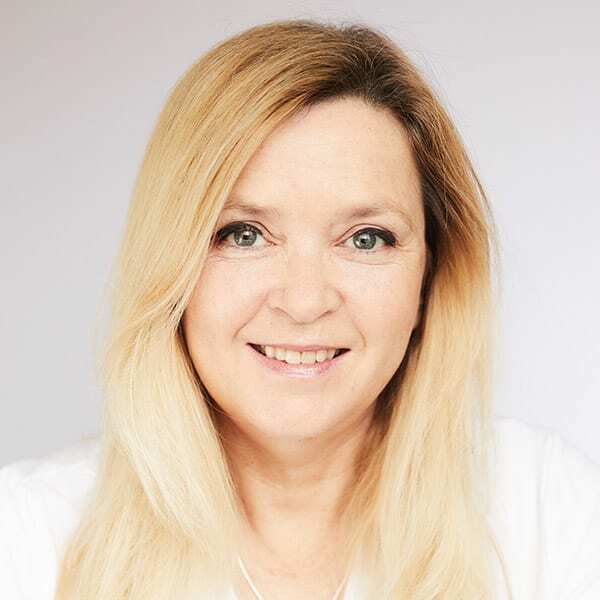 Lifecycle email marketing allows you to create helpful, personalized and customer-focused emails that show your customers you know who they are, that you are positioned to serve their needs as well as your own and that you can be a trusted partner in helping them achieve their goals. When you help your customers achieve their goals, they, in turn, helps you achieve yours. Everybody wins!